Disclaimer: I have no idea about bike world. BUT, I have access to people who know hell of a lot about bikes. They own them, breath them, and live with them day in day out. So me being myself subcontracted the whole bike buying affair to one such friend of mine. My requirement, was simple to him, I want a good bike. 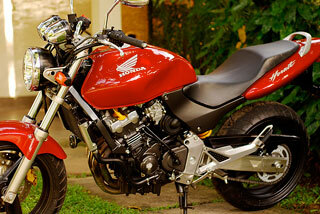 Finally both of us decided on Honda Hornet 250 (2005 Model, 130 series). Again, myself being myself, I started reading about Hornets on the internet and now I am beginning to fall in love with this machine. This bike was launched in Japan in 1996 and it revolutionized the naked street bikes. 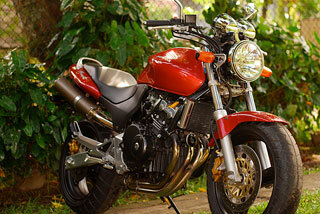 It is fitted with CBR250FOUR engine. CBR 250 and Jade didn't do well in Japanese domestic market, so Honda used the same engine and remade Hornet with aggressive styling, and FAT 180 back tier striped from Fire-blade 900 (Yes, the 250 is fitted with a larger tier than the CBR 400 at the back) created a new appeal for this bike. Honda made Hornet only as a domestic model initially (Hornet 250 is still a domestic model). Whoever reviewed the bike from outside Japan, in 1996 - 1997 time frame, had one minus point about this bike, its not available outside Japan. 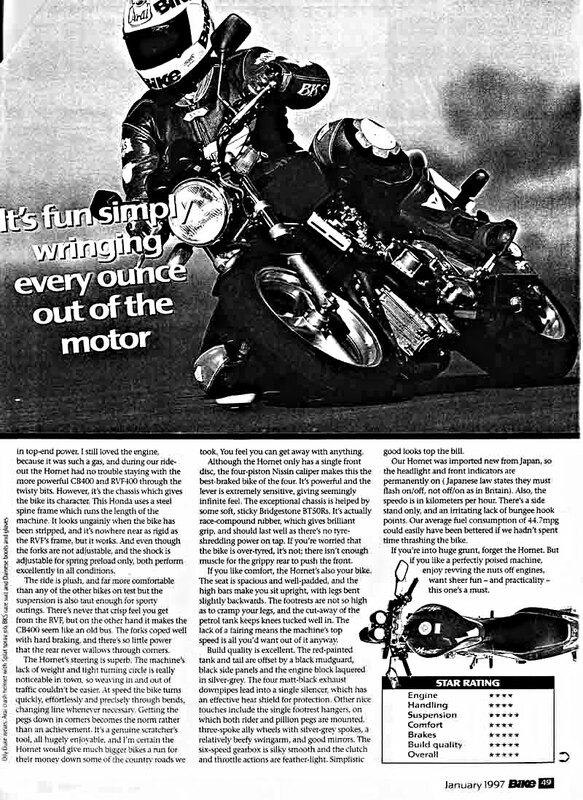 However few imported the bike to UK, and when people started loving it, for its handling, seating position, style (it has a nick name "Horny Hornet"), impressive performance, and excellent suspension, they wanted more. EVeryone wished for 600 cc and 900 cc version. 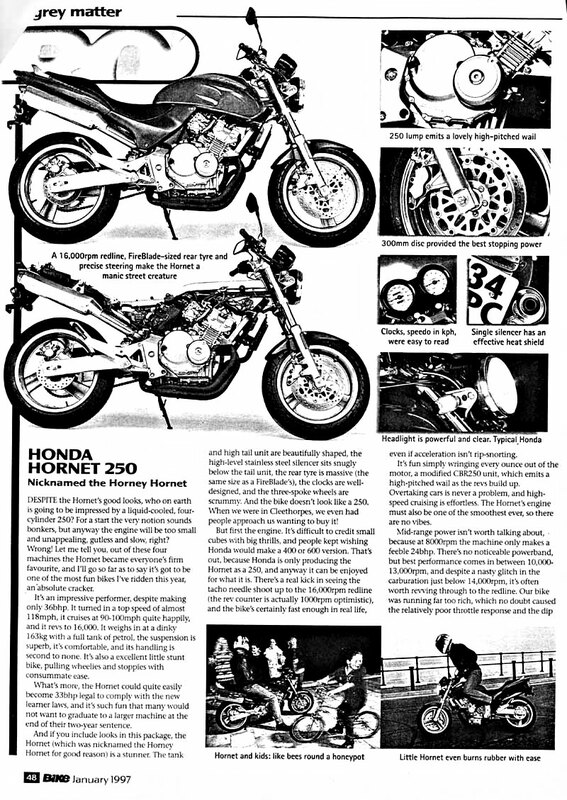 No one thought Honda would make such a bike back in 1997. However Honda introduced the 600 cc in UK in 2001. 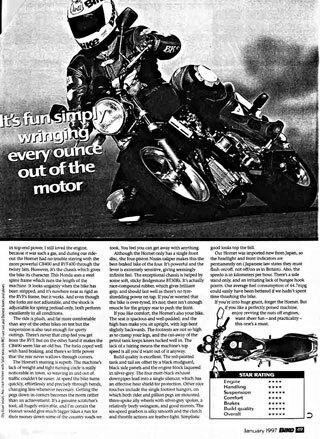 Honda Hornet 250 is the Original Domentic Model, and it is still the domenstic model, and for outside world Honda makes the 600 and 900s. It's best I link to an article printed in 1997 in a Magazine which I found on the web, which is rich in information. If you want to know more about Hornets here are the links to two pages. I just realized, although I have not been writing on this blog for a while, that did not mean, that I have not been writing at all. Recently I wrote a research paper on hurdles that software industry is facing due to Moore’s law. From the time the CPU industry shifted to Core based architecture to build CPUs, one question I have been trying to answer is “what does the future hold for the Desktop software world?”. If you are a manager and if you didn’t realize the paradigm shift this muti-core based architecture has brought to the table or how much of a disruptive technology it is, then this paper is for you. You will begin to see the multi-core in new light. Here is the paper for you. I know. I know. I have had lot of WTFs for not posting and posting some nonsense over past several months. Work, studies, and obviously the other commitments(:-)) has kept me away from my blog. I am thinking of coming back to blogging. First let me know tell you, that my Mac experience has been truly amazing. Not just the OS itself, but the breed of applications available for Mac share a class of their own. Let me try and explain why this is the case on a different blog post, but for now, let me introduce my bookshelf to you. I have not be able to organize it properly yet, into different categories. Thats going to take sometime and probably I will get around doing that after my exams.